EB Assist ADTF (Automotive Data and Time-Triggered Framework) is a tool for the development, validation, visualization and test of driver assistance and automated driving features that includes the latest technology. You can deliver advanced driver assistance systems (ADAS) and highly automated driving (HAD) features to your customers with EB Assist ADTF. This trustworthy tool is flexible, efficient, extendable, and stable. EB Assist ADTF combines a development environment with an interactive work environment. Developers can use the graphical user interface and existing modules to create new configurations without writing a single line of code. They can use drag-and-drop to define the data-flow between software components and execute this immediately to see the effects. 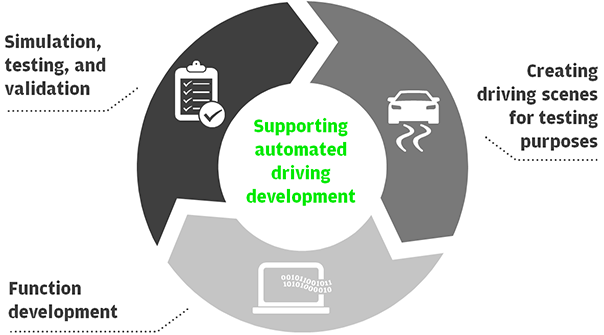 Faster development of driver assistance and automated driving software modules is facilitated by the libraries and toolboxes for various functionalities, which can be easily integrated into the framework. EB Assist ADTF is designed to be used in the lab as well as in test cars. EB Assist ADTF describes a binary standard. The functional interfaces and data formats are open to developers. The framework is available for Microsoft Windows and Linux operating systems. Contact us for your free evaluation license to experience EB Assist ADTF! 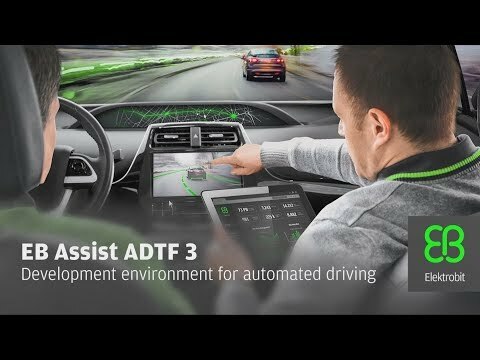 EB Assist ADTF is one of the most widely used ADAS development and test environments in the world. EB Assist ADTF allows you to benefit from the latest improvements and enhancements which the “EB Assist ADTF customer forum” makes. This customer forum consists of leading German carmakers and suppliers. They drive the development of EB Assist ADTF features with their collective feedback that mirrors the results from the latest R&D. EB Assist ADTF is a single tool that supports multiple use cases and numerous applications. These range from comfort and safety to highly automated driving features, and from pre-development to series projects. It has a rich set of ready-to-use components and provides easy data exchange. EB Assist ADTF is a modular system with standard components and open interfaces. It can therefore form the basis of a variety of applications which will save you time and money. EB Assist ADTF was built with customization and flexibility in mind. Its open interfaces provide the option to exchange components in binary form and let you protect your IP at the same time. This allows an optimized workflow between carmakers, suppliers, and partners. EB provides a large number of add-ons and interfaces for various use cases (e.g. electronic horizon, EB robinos) and other well-established tools and standards (e.g. MATLAB Simulink, AUTOSAR). This allows accelerated and flexible development of ADAS and HAD. Elektrobit has been the distributor and service provider of ADTF for almost a decade, with extensive experience in customer and project support, maintenance, and training. Carmakers, suppliers, and partners worldwide trust the competence and expertise of EB in ADTF. The newest version, EB Assist ADTF 3, provides high stability and increased performance to meet the needs of complex HAD development. EB offers an attractive migration package for customers who wish to upgrade to version 3, which allows seamless implementation. You can also benefit from EB’s expert know-how through various training offers for EB Assist ADTF. Capture and synchronization of data from multiple, different sensor sources such as radar, lidar, camera, etc. Licenses for EB Assist ADTF to accommodate your specific requirements.